In the wake of recent financial crises, firms of all sizes have adjusted their policies to incorporate more frequent instances of collateral management. 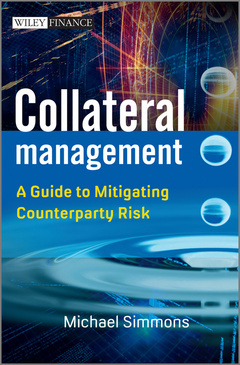 Collateral Management: A Guide to Mitigating Counterparty Risk explains the connection between the need for collateral management in order to alleviate counterparty risk and the actions that firms must take to achieve it. Targeted at middle and back office managers seeking a hands-on explanation of the specifics of collateral management, this book offers a thorough treatment of the subject and attends to details such as internal record management, daily procedures used in making and receiving collateral calls, and settlement-related issues that affect the movements of cash and securities collateral. An expert in financial topics ranging from trade lifecycle to operational risk, author Michael Simmons offers readers insight into a field that, so far, is struggling to produce enough expertise to meet its high demand. Since 2008, firms have recognized and embraced the importance of collateral management, but this book will provide practitioners with a deeper understanding and appreciation of its relevance. MICHAEL SIMMONS is a financial services operations specialist with expertise in post-trade processes. For over 20 years, he worked at a blue-chip investment bank (S.G. Warburg and Warburg Securities) where he was the manager of Fixed Income (Bond) Operations. Over these two decades of hands-on experience in the field, Mike identified a need for practitioner-oriented education programs on multiple aspects of operations, including the securities trade lifecycle, corporate actions, operational risk and associated controls. He thus began writing and delivering popular training courses, including the Operations Certificate Programme (a 5-day multi-subject examined qualification) for the International Capital Market Association. He is the author of two previous books, namely Securities Operations and Corporate Actions.